As a representative of concrete-minimal art Charlotte Posenenske was among Germany's leading artists in the 1960s. She aspired to a clear, hard realism of form, production, distribution and reception - all conditions that in the context of the 1968 movement meant changing society. In 1968, having come to the conclusion that art ultimately cannot have sufficient political impact Posenenske took the radical step of giving up art altogether. She went on to study sociology and worked as a social scientist. Even though she could not envision political issues being pursued within a conceptual approach, it later became clear that she had formulated important aspects in her art that only came to bear in Concept Art in the 1970s. These aspects included the variability of objects, participation in production, the inclusion of a specific situation, a social context and institutional critique. The exhibition at Between Bridges is the first presentation of Posenenske's work in the UK and is installed by Konstantin Adamopoulos. Here earlier paintings are shown alongside the works from the series that concluded her art practice. The Series DW is part of the larger body of work, Square Tubes, that was first shown at the influential Konrad Fischer Galerie, Düsseldorf in 1967. 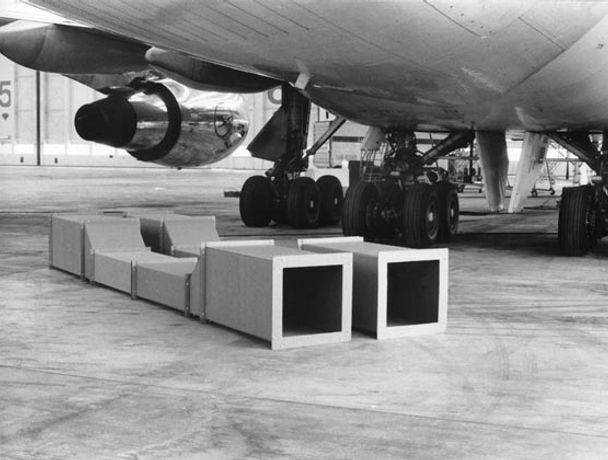 The Square Tubes are modular constructions made up of 4 or 6 standardised elements that can be bolted into different combinations; they stand, lie or hang. These technoid and hollow objects are manufactured industrially from cheap sheet metal or corrugated cardboard and are therefore endlessly reproducible just like consumer goods. The figurations are as a matter of principle unfinished, expandable and therefore variable. The collapsibility of the corrugated cardboard elements highlights the relationship between surface and inner spatiality, which is at the same time a comment on the monumentality of architectural construction. Posenenske's work, which only in recent years has been rediscovered, was shown in a retrospective at Galerie im Taxispalais, Innsbruck and Museum für Gegenwartskunst, Siegen, both in 2005. In June this year her work will be featured in Documenta 12, Kassel.